It's that time of year that everyone gets ready for Halloween...so why not come celebrate with Force-E! We have two presentations by local photographer Suzan Meldonian, Alien Nation on Oct 19 at Force-E Riviera and Monster Mash on Oct 25 at Force-E Boca. The presentations will be on the bizarre aliens and monsters of the sea, many found right here in our own backyard at places like the Blue Heron Bridge, and just off shore drifting in the Gulf Stream Current. We will start at 6:30 pm with a social then she will present with her slide show of some of the photos of "monster-like" critters...so let’s welcome in Halloween. Love dressing up for Halloween? 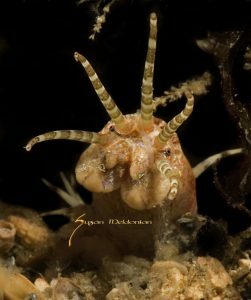 Then join us on Oct 28 for our Free Blue Heron Bridge Halloween Night Dive. Starting at 6:00 pm, join us for a Hot Dog BBQ and come to the BBQ in your Halloween costume and walk away fed and with prizes! Also that night we have the rep from SeaLife Cameras there to demo the new Sealife Micro HD+ this is a separate event so make sure to sign up online if you would like to demo a camera! Wanna have even more fun??? 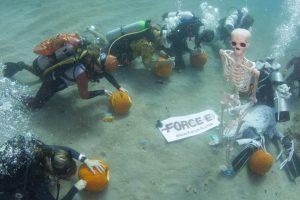 Join Force-E on Oct 29 for our Halloween Boat Dive in Pompano Beach with Sealife Cameras and the boys of Scuba Nation! First stop/dive will be the haunted "Wreck of the Tracey" where you will do some "trick or treating" underwater style. Prize will be awarded for the best Underwater Halloween Costume. Second dive site will be a shallow reef with lots of sand near by to use as a studio for the Underwater Pumpkin Carving Contest. There will be prizes for the Scariest and Most Original. Sign up for this event online to reserve your spot on the boat. Fish deserve to have a spooky Halloween too! See you at our fun events!